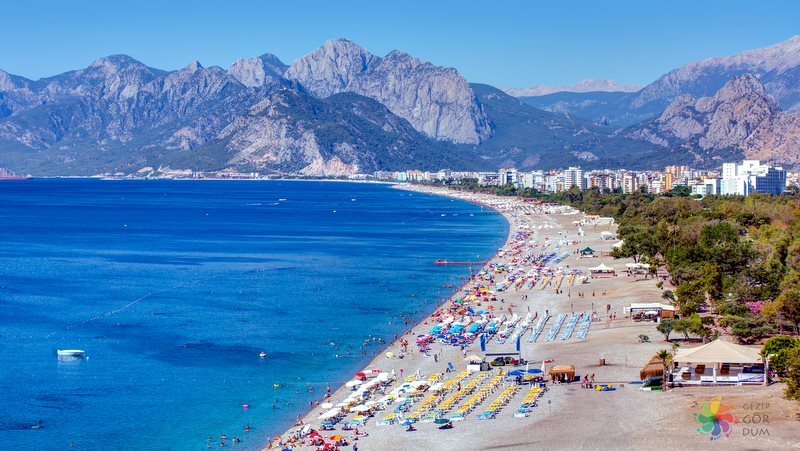 Antalya is one of the most favorite Turkish resorts. Tourists from various countries come here to enjoy amazing beaches, sunny hot weather, and to get a tan. However, not many people are aware of cultural, architectural monuments and natural resources here. There are parks, statues, museums, and ancient buildings worthy to see. Walking around Kaleici you are going to see places built during Roman and Ottoman Empires. Everybody will enjoy day or evening there. No matter if you are there for a romantic walk, alone, or with a big family. Curvy paved streets will take you to ancient Turkey, where you can buy souvenirs such as Turkish delight, coffee, jewelry, or spices. You can also try famous Turkish ice cream. It has a special, like a dough, texture. 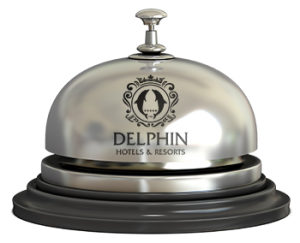 A server spins it, throw it in the air, and does a magic tricks before giving it to you. This ancient mosque is located in the Kaleici. It was built in 1230. Although it was ruined and reconstructed in the 14th century it is still an existing example of early Islamic architecture. 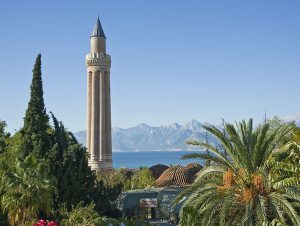 Grand Mosque is a symbol of Antalya. 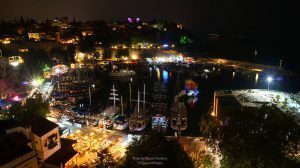 While being in Antalya you will be able to view this historical building from any point you are at. The minaret’s height is 38 meters. Imagine yourself walking in wood’s shadow and breathing fresh air while watching flower’s blossom. Park Ataturk is a gorgeous place. It was named after the first Turkish president. Here you can find a bunch of places, such as observing points, restaurants and cafes with a fascinating view on Mediterranian Sea and Kaleici. You can enter Kaleici through Hadrian’s Gate. 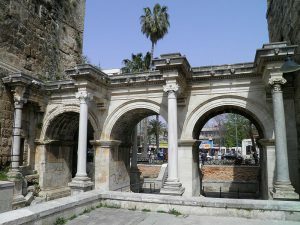 It is a memorial in honor to Roman’s emperor Hadrian’s visit, who came to Antalya in 130. The Three Gate is made from white marble. Originally, it had two levels. Only the first one stayed there till our days. Some days you can go to a Turkish market, where you can experience the oriental culture. Try fresh fruits, vegetables, nuts, fish, and seafood right from Mediterranean sea. Buy some gifts for your family and friends (or indulge yourself with a little present) such as local souvenirs, purses, carpets or crafts. Haggling, or bargaining, is an interesting of Eastern countries including Turkey. It is a social practice when you as a customer are trying to get an item for a price you like while a seller is insisting on special features and high qualities of it to keep a price high. Sometimes haggling you can lower a price two times of the original one. So do not rush, enjoy bargaining! It was established in 1919 in Konyaaltı. 13 exposition halls are full of various artworks and natural history items. Halls are grouped by time period or a type of exhibits. For example, there are Proto-History Hall, Hall of Church Artifacts, Mosaic and Coin Halls. There you will find sarcophagus, statues of mythological figures and emperors, and coins used in Ottoman Empire. 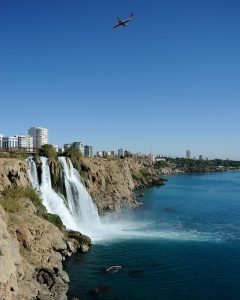 If you feel like hiding from the sun and beach – spend a day by Düden Waterfalls. You are going to enjoy a wonderful view and fresh clean air over there. Any time of the day these waterfalls are beautiful. In the morning you can observe a rainbow on the bottom. In the evening there is a lighting, which creates an effect of miracle on waterfalls. You can approach very close to the waterfall on the top. The lower one is flowing into Mediterranean sea. Take a walk in a green blossoming park around there, take a sit on the bench and enjoy the unforgettable view. The aquarium is located inKonyaaltı by the popular shopping center Migros 5M. 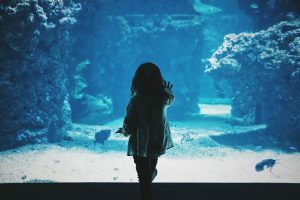 According to Aquarium’s official website, it is “The world’s biggest tunnel aquarium!” Imagine the sizes: the length is 131 meter and the height – 3 meters. 40 aquariums there have themes, such as Indian, Atlantic and Pacific oceans. Snow World is an interesting attraction, where you can see igloos, snow figures, you can even play with snow and slide from the slope! 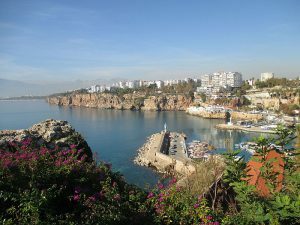 it is only a short list of all the amusing things Antalya has! This historical city has many surprises and places to discover.